"I very much enjoyed your London walks"
"PowerHiking New York City is a unique addition to the travel guide genre. It is usefully organized around 14 walks of Manhattan Island, on the theory that the best way to see a city like New York is on foot. Each walk includes descriptions of historical, cultural or scenic neighborhood sites to visit or just admire. The authors also suggest places to stop for a bite along the route. The compact size and easy to read maps make the guide very user friendly and there are great color photos throughout." "This guide offers the visitor a way to experience a variety of New York City's most interesting neighborhoods close up. The walks range from from 3 to 8 miles in length and the guide provides insider information about local attractions on each walk, as well as dining and shopping tips. It also gives Manhattan residents a fun way to combine exercise with exploring the city. We always provide out-of-town guests with a copy of PowerHiking to enhance their stay." "I think the NYPowerHiking guide they put together was a great introduction for any 1st timer in New York! It was perfect for anyone who loves the outdoors and would rather see the streets of NY instead of cabbing and taking the subway to individual places." "I had the best of all worlds...in Paris. Each hiking/walking day was filled with new adventures, consisting of a great variety of sights and treasures. I couldn't wait to get up each morning and follow the two of you around Paris. Your knowledge of the highlights of the city, including its magnificent secrets, reflects the hours....spent walking its pavement and cobblestones. What I remember most is the excitement and joy....Your enthusiasm was irresistible.....and created magical memories for me." "You two are amazing! You charmed us all. Thank you, once again, for a wonderful day. Your talk was interesting, informative, and full of humor." "I really enjoyed your Paris book. The cafe near Les Invalides is great!!" "Just to let you know that your book gave us the freedom to eat our way throgh Paris and not gain a pound. We did cheat a few times and metroed back, but your book guided us through the most wonderful streets and introduced us to amazing sights. We have been to Paris several times and haven't experienced all that we did this time. Thank you for that! Thanks for the warning about the lights going out in the toilets. The first time that happened to me, I just laughed thinking of you. If I hadn't been warned, I would have freaked out!!" "YOUR LONDON BOOK IS GORGEOUS!! I've done 9 of the walks already and they are not to be missed. The Chelsea Flower Show and Kew will be on "my List" for my next trip to London. Looking forward to them." "Congratualtions, on your new book! I'll look forward to seeing and, of course, to buying one. We used your book for SF on Mother's Day and had a great hike. It's a wonderful book and was a great guide for us. Thank you!" "San Francisco, a city I knew well, and Paris, a city I know well, are going with me to the country for my weekend family read. I am thrilled to have them for my next adventures to the San Francisco and Paris destinations." 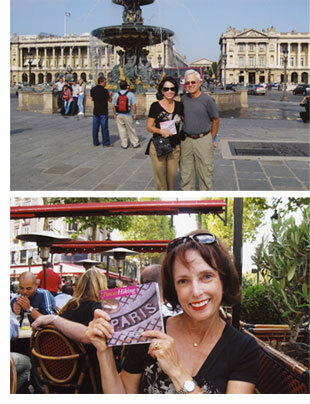 "After reading your Paris book I realized that there are many more places I have not discovered. Showed your book to my French teacher yesterday and she thought it was "right on". "What a great gift idea!" "Cathy, what a hidden jewel that walk is down from Telegraph Hill! I had no idea it was so lush and beautiful....and totally inaccessible by car. Great hike!" "PowerHiking San Francisco is wonderful... an absolute treat to page through. Thank you both for taking the time to create a rich photographic journey across a city I love." "Getting rave reviews on the SF books that I gave as Christmas gifts"